It’s the end of summer but the weather is still nice enough to enjoy eating outdoors. However, I find that it’s too cold for diner on the deck so having an end of summer luncheon is a way to extend the season. I had a luncheon last week for nineteen people. It was fun to set three tables with three different themes. Using many of the products my company designs for Marine Home Center I put together three different settings for a table to seat eight in my dining room with the French doors wide open to the deck where I had a table set for six and a grouping of five more around a coffee table on which I had an extender to widen the circle. 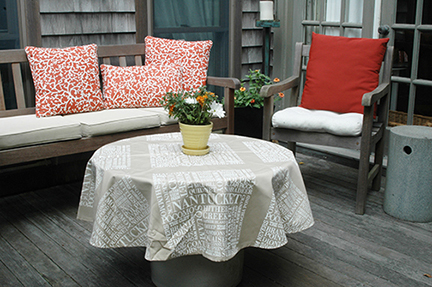 I covered this with one of my Nantucket Name tablecloths made from Sunbrella fabric. Here’s how each was set to give you some fun ideas for creating a different scheme for casual entertaining. 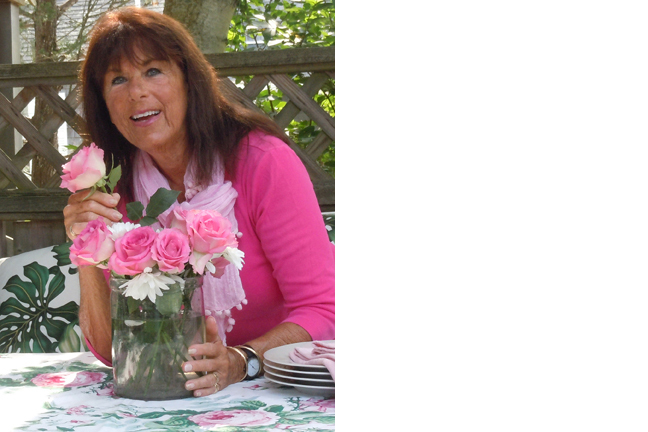 For the outdoor table of six, my theme was summer roses. 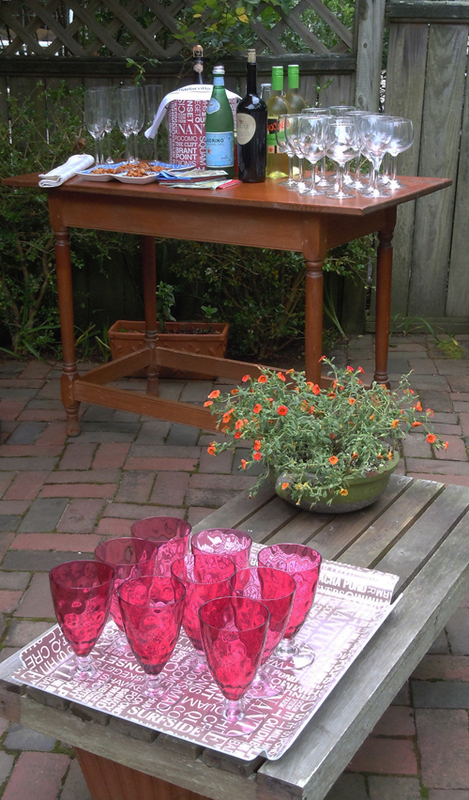 I set that table with a cabbage rose and leaf-patterned tablecloth. Tim at The Flower Shop at Marine Home Center arranged pink roses and white daisies for the low centerpiece in a wide, glass, round candleholder I use as a vase. I added two large leaves under the vase to echo the centerpiece inside. For this table I used green chargers and white plates along with pink linen napkins. For the smaller seating arrangement I used my white on beige Nantucket Name tablecloth. Since it was designed for an umbrella table it has a hole in the center that I covered with a green bowl holding a plant of deep orange flowers. I used beige and white plaid napkins for this table. The white plates are rimmed with a band of beige. Each table held one of my Nantucket Names wine bottle cooler in an appropriate color and at each person’s plate I had a gift of one of my Nantucket Name greeting cards. I think it’s a nice touch to have a little something for each guest to take home with them as a reminder of a fun time. It might be a small bag of candies, for example like those found at the Flower Shop or Sweet Inspirations. My friend Peggy, who entertains often, usually includes a little memento at her tables and we always look forward to this creative surprise. It’s the grown up version of the “take home” bag given out at children’s parties. One of my guests, author Nancy Thayer said, “Would you come over to my house and advise me on my garden.” “Just buy pots of Autumn colored mums,” I advised and put them around the yard, patio or deck in interesting pots. You can always plant them more permanently when you have time but for now it adds color where summer plants are looking scruffy. End of summer plants are on sale and I’ve used everything from a painted bucket to a watering can as containers for lavender, a rose bush, black-eyed Susan and mums for color where needed. Now I can cut back my leggy and browning perennials without looking barren around the deck. Use lightship baskets grouped together to hold dried hydrangea blossoms. 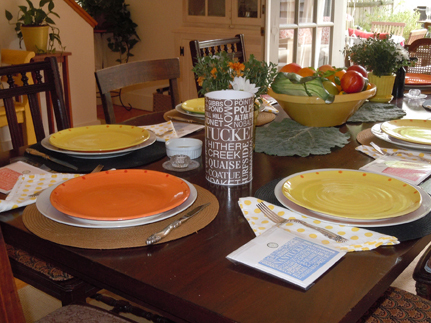 Pull colors from your chinaware, linens and vases to emphasize on the table. Set a black and white table then tie each napkin with a red grosgrain ribbon. There is nothing more beautiful than a basket filled with scallop shells in the center of the table. My friend Jean uses them for placecards as well.